About one-in-four Volkswagen Golfs sold locally are the GTI version – compared to a global average of just five per cent – so it makes sense Opel would expedite the arrival of its hi-po hatch. It comes to us with a familiar name, the Astra OPC (the latter standing for Opel Performance Centre), and a similar philosophy to the world’s best hot hatches: a lot of power in a pint-sized package. It gets leather sports seats as standard, but metallic paints adds $695 (ouch) compared to $800 in the Renault Megane RS (double ouch) and $385 in the Ford Focus ST (that’s more like it). The Astra OPC’s turbocharged 2.0-litre engine (the class staple) has the most power and torque among its peers (206kW and 400Nm), but this doesn’t translate to quicker performance (see driving). The interior has a much more upmarket appearance than the Renault (although equal to the glossy materials in the Ford Focus ST) and its superb sports seats are a win. However, the biggest consideration for value is what the car will be worth when you go to sell it. Depreciation is the single biggest cost of ownership after the purchase price. 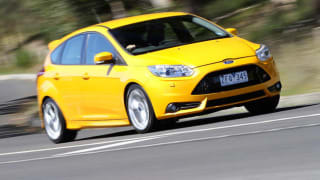 The Renault Megane RS and Ford Focus ST don’t have the strongest resale values either (the Renault because it’s a niche product and the Ford because it is still building its reputation with the new ST badge). The Astra OPC has a suspension system it calls “Flexride”, but they could easily have called it “magic carpet ride”. Despite riding on massive 19-inch wheels and Pirelli P Zero tyres (the in-vogue performance tyre among all the thoroughbred brands) the Astra OPC glides over the worst roads that our respective state governments can throw at us – despite the trillions they take in tolls (sorry, wrong forum). A mechanical limited slip differential, favoured by the Renault Megane RS and the Opel Astra OPC, helps drive power to the inside front wheel in tight turns. Electronically-controlled front traction systems (which I dare not call an electronic limited slip diff as some car makers do – glaring at Ford and VW again) are okay in normal driving conditions. But when corners start to tighten they’re all but useless – despite what the brochure says. But good design needs to go all the way in my opinion and be functional. Unfortunately the Opel audio and air-conditioning controls seem more of a challenge than a welcoming invitation to the interior. Too many buttons that take too long to figure out. We drive more than 250 cars a year and if we need to consult the owner’s manual after 30 minutes of trying, that’s a fairly good sign that it’s not intuitive. Looks great guys, but make it easier to use next time. Six airbags, five-star safety and a three-stage stability control setting (depending on how brave you want to be). The Renault gets eight airbags (if you’re counting) but the crash score is the same. Good road holding also deserves credit here, and the Opel Astra OPC has that in spades. The Pirelli tyres are among the grippiest in the wet or dry on the road today. It’s why they’re favoured by Mercedes-Benz, Porsche, Ferrari and others. The four-piston race-bred Brembo brakes are good but don’t have the same precise feel as the Renault Megane RS265 we tested back-to-back. The only blots on an otherwise impressive report card are the lack of front parking sensors or a rear camera – even as an option. A job for the facelift then. Opel likes to say its car is more capable around town than its hot hatch peers – but in addition to the turbo lag it has the broadest turning circle (12.3 metres, bigger than a Toyota LandCruiser Prado, which is 11.8m if you’re wondering). The Astra’s brake pedal travel is a little longer, as is the gearshift throw. Neither feel like a true performance car. In the Renault Megane RS265 each movement feels like you’re operating a pair of scissors, so precise are the responses.